In 1835, Charles Darwin documented the presence of iguanas on Santiago island, the largest in the Galapagos archipelago. It probably never dawned on the pioneering naturalist that he would be the last scientist to do so. Invasive species wiped the island clean of iguanas—an ecological void that’s now been filled thanks to an ambitious restoration project. Cats, dogs, and rats, along with feral pigs, goats, and donkeys, made life impossible for iguanas on Santiago island after Darwin returned to Great Britain. These invasive animals either feasted on juvenile iguanas and iguana eggs, or out-competed them for food. 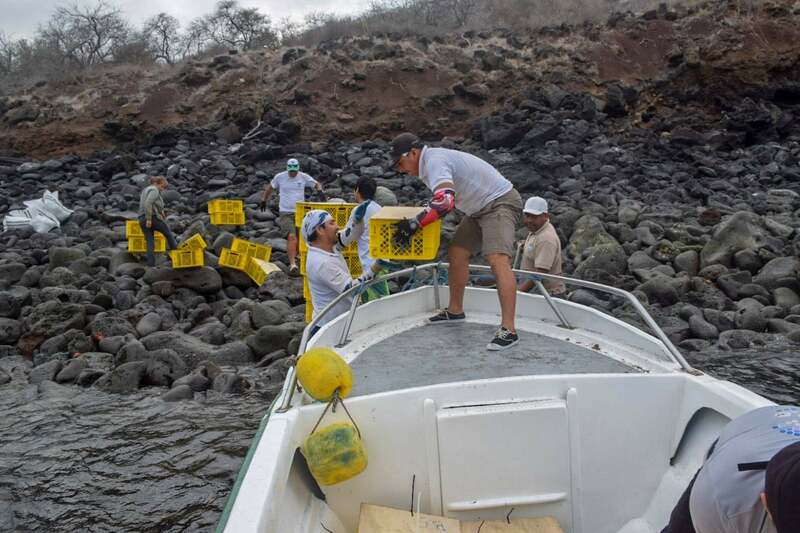 Since 2000, conservationists and ecologists have been removing these human-introduced animals from Santiago in hopes of restoring the Galapagos island to its former ecological glory. As part of this project, called Operation Isabela, over 18,000 pigs and 55,000 goats were eliminated, with the island receiving pig-free and goat-free status in 2004 and 2006 respectively. 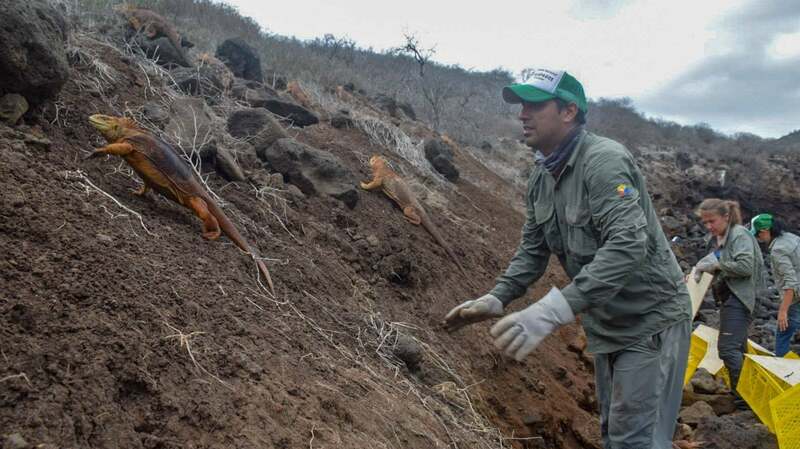 Now, with the non-native competition removed, some 1,436 land iguanas (Conolophus subcristatus) have been transplanted to Santiago’s coastal areas, specifically along Puerto Nuevo and Bucanero, according to the Directorate of the Galapagos National Park (DPNG). Both regions feature ecosystems consistent with the iguanas’ natural habitat, so these newly introduced reptiles should be able to thrive and rekindle an ecological cycle disrupted by their long absence. “The terrestrial iguana is an herbivore that helps ecosystems by dispersing seeds and maintaining open spaces without vegetation,” said Danny Rueda, director of DPNG, at the Parque Nacional Galápagos Facebook page. This DPNG effort to restore the Galapagos ecosystem was done in cooperation with Massey University of New Zealand and the Island Conservation organisation. Some 25 DPGN park guards were involved in the project, which reached the important milestone earlier this month. The first two phases of this four-phase project began late last year with the capturing, transporting, and quarantining of iguanas from North Seymour, a small uninhabited Galapagos island. The third phase, conducted between 3-4 January, saw the release of the iguanas to Santiago. The final stage will happen in February, as conservationists will monitor the iguanas to make sure they’re adapting properly, to see how many survived the transition, to find evidence of reproduction (such as the building of nests), and to conduct an analysis of vegetation on the island to get a sense of how much these reptilian herbivores are eating. In addition, a permanent management programme will be introduced to keep an eye on the iguanas and potential threats arising from the newly-introduced species. This project will also be of benefit to North Seymour Island, which was home to over 5,000 iguanas prior to the relocation project. These iguanas were placing considerable strain on the tiny island’s limited food sources, especially cactus. A small population of iguanas will remain on the island to maintain its ecological stability.